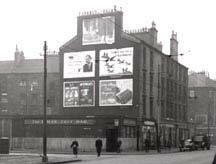 188 Rutherglen Road/ 2 Camden Street, Gorbals, Glasgow. The Holly Tree Bar. 1960s. The Holly Tree Bar was situated at the corner of Rutherglen Road and South Shamrock Street which later became known as Camden Street. This old pub was once owned by the well known and respected Hurrel family. The winners of the Southern Glasgow Darts League representing the Holly Tree Bar. 1964. The trophy was presented by Mr R Smith treasurer of the Southern Darts League to Mr James Connelly.Left to right Mr J Welsh (captain, 2nd team,) Mr F Blackstock (captain, 3rd team,) Mr T Blake (secretary, 1st team,) Mr James Connelly proprietor and Mr R Smith.